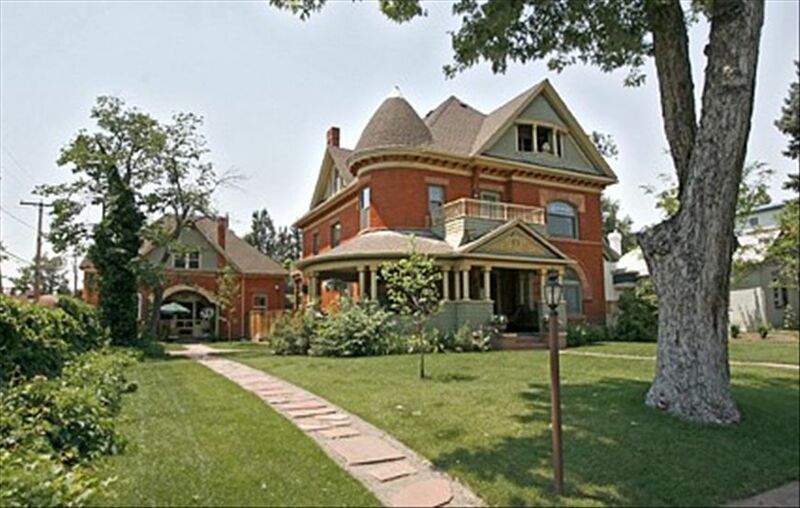 This flat is the top floor of a historic home on beautiful grounds in the trendy Highlands Neighborhood just fifteen minutes walk from downtown Denver. You have views of both downtown Denver, and the Rocky Mountains. There is a private entrance to the flat that also leads to a balcony overlooking the backyard and mountain views. In addition to being very close to downtown Denver, Convention Center, Coors Field, Sports Authority Field, and the Pepsi Center, you are located in an area where there are several top-rated restaurants and boutiques within walking distance of this property. Easy access to I-25 (North/South through city) and I-70 (1 1/2 hour to ski areas). We have lived in the neighborhood for over 20 years. We live in the lower level of this house and it is our dream home. Maintaining the house and gardens is a labor of love for us. We have been hosting through HomeAway for over 10 years and have thoroughly enjoyed the experience. We are located in the highlands neighborhood. It is populated with several "Best of Denver" restaurants, coffee shops, and boutiques. We are also waling distance to Mile High Stadium, Coors Field, and the Pepsi Center. This home was very comfortable, clean, and in a great location. Four of us were very comfortable and had plenty of space. All the staples in the kitchen. Highly recommend! Fantastic, clean, spacious and well-equipped space in great neighborhood! This is a peaceful, clean and well-equipped property. Very spacious and in a lovely neighborhood that is within walking distance to so many places and downtown. The owner was quick to respond to our questions, very sweet and helpful. Could not say enough good things about this spot, one of the best VRBO experiences. What an enjoyable place to stay! I stayed at Darci and Dave's with my daughters. It was a wonderful location in a quiet neighborhood with easy street parking - plus many excellent restaurants are within easy walking distance. We often had breakfast on the outside porch in the morning and watched the world go by. It was a great jumping off point for trips to Boulder, Red Rocks, and Mt. Evans. I would definitely stay there again. Charming flat clean updated and comfortable. Darci and Dave great hosts. Close to downtown as I was at a conference at convention center, a 2mile walk and easy to get to. Highland area has many restaurant establishments in close proximety to flat. Flat easily accommodates four adults, plenty of hot water. It was great to have a washer and dryer in flat. All necessary kitchen items to prepare meals. Plenty of fluffy towels. WiFi. Even my 86 year old father was able to get up the stairs and enjoyed the flat. I would definitely return to this property when I travel to Denver in the future. Front & back porches to enjoy the view! Street parking - never a problem. Comfortable 3rd floor of a stunning Victorian gem. Spectacular views of downtown and the mountains. Several excellent restaurants within 5 blocks. Plus a great library. The stairs are a good workout. Washer and dryer! My 1st VRBO was a keeper. We were in Denver with our adult son between Christmas and New Years. Lodgings were just right - homey and comfortable. Easy access to downtown walking or driving - just 2 right turns coming home at night! Everything was clean and well appointed. Dave and Darcie were friendly, helpful, and unobtrusive. All in all, a really nice stay. 1 mile from Coors Field, Pepsi Center, Invesco Field, LODO. Ski: Ski areas are all 1 to 1 1/2 hours from Denver. Loveland, Breckenridge, Keystone, Vail, Arapahoe Basin, Copper Mountain, Eldora are all easy day trips from Denver.